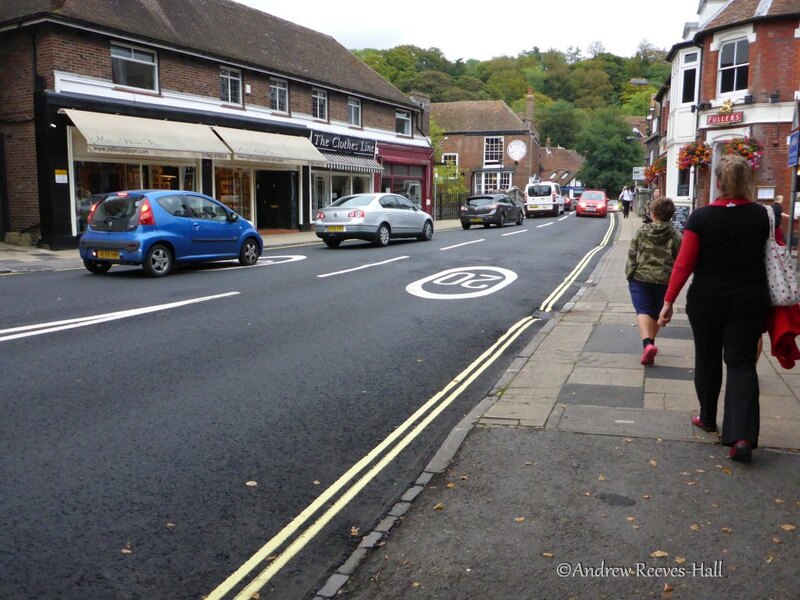 The 20mph area was ‘made’ on 18th August 2014. It covers the city centre. Alfred The Great, King of Wessex from 871 to 899, is said to have improved his kingdom’s legal system, military structure and his people’s quality of life. 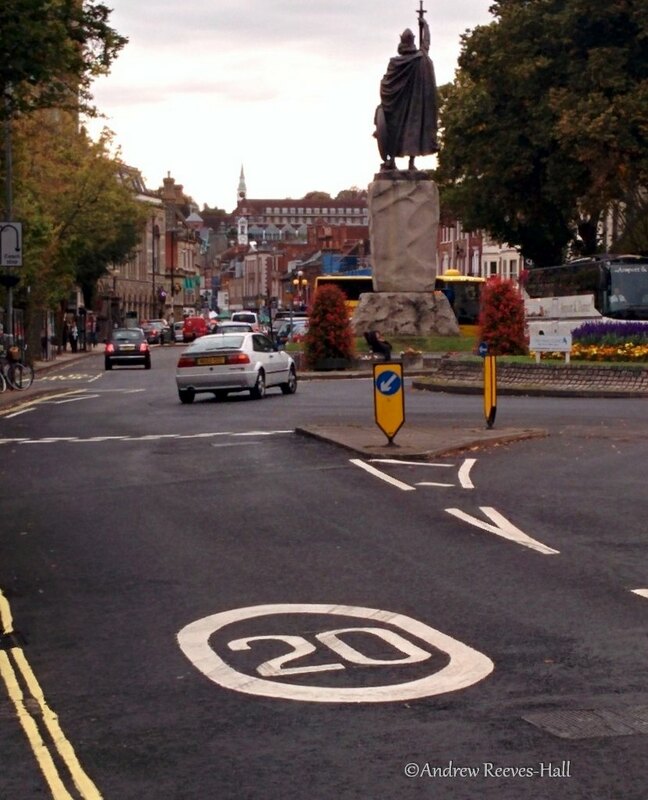 Now, 1100 years later, his city’s quality of life is being improved once again: Winchester has joined the mushrooming number of places that are introducing a 20mph speed limit across much of their city (or town) centres. There already was a small area with the 20mph limit but now it has been extended across the ancient city’s centre (but oddly not its residential outer areas). The lower speed limit adds just over a 1 minute to a car journey across the city, which is about 1.2 miles whether traveling east / west or north / south. Slowing motor traffic down makes a place more ‘livable’ and the people in the area more healthy. Following the media publicity around the new scheme, people have been left with the impression that they can ignore the new speed limit with impunity (tip: they can’t). Roundels in the road remind people of the 20mph speed limit. 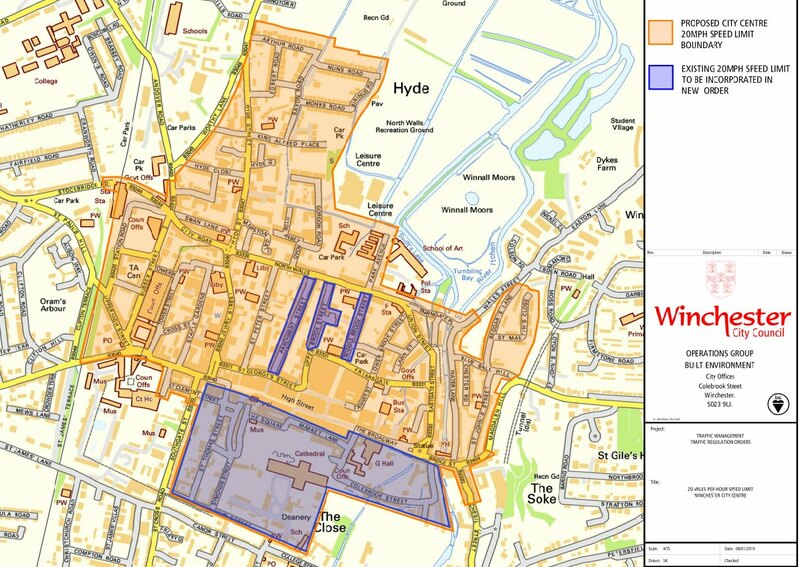 The existing 20mph limits have been extended to cover the entire city centre of Winchester as of 18 August 2014. Two weeks ago, I queried the elected Simon Hayes (independent) Police & Crime Commissioner (“PCC”) for Hampshire & Isle of Wight as to why his force had left people with the impression that speed enforcement would not be taking place. He has just replied – after a gentle prod – and at length, quoting from the original consultation documents on the scheme. That is, the DfT say in effect that the police shall continue with their routine speed enforcement activities; The number of drivers and the number of roads in the area have not changed, so why should the enforcement of its speed limits? 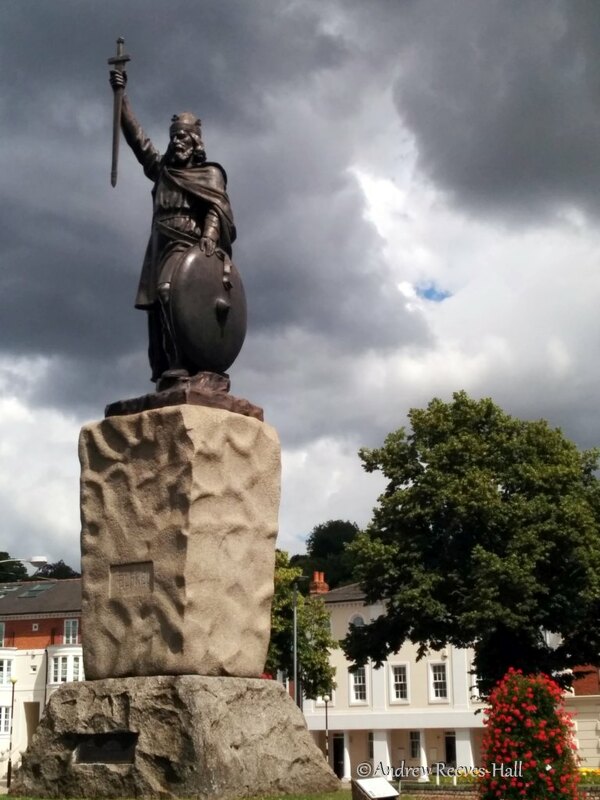 King Alfred improved his kingdom’s legal system, military structure and his people’s quality of life. I have gone back to the PCC and asked him and the Constabulary to make a clear statement that routine enforcement – including in the 20mph area – will continue as usual. See the CORRESPONDENCE section below. I suggest you do not believe everything you read in the press. The police said no such thing and the 20mph limits are perfectly enforceable. But that misses the point. Yes, we all agree the limits are ‘perfectly enforceable’ but we have the media quoting the police about not enforcing them! I am dumbfounded as to why it is so difficult to get a simple statement out of any official along the lines of ‘we will be enforcing the speed limits, as we do in our normal routine’ (aside: I am looking for a plasterer who can patch up head-shaped dents in my walls). Let there be no mistake, 20mph limits are enforceable and are being enforced by many police forces in the UK. We have a long tradition in this country of democratically elected representatives of the community setting laws, a professional police force enforcing and an independent judiciary sentencing. So [it is] concerning to see Police attempting to thwart democratic law-making by selectively withdrawing their services based on their own prejudices rather than community concerns. Unfortunately police show this trait on almost every new law that is brought in as a result of changing cultures. 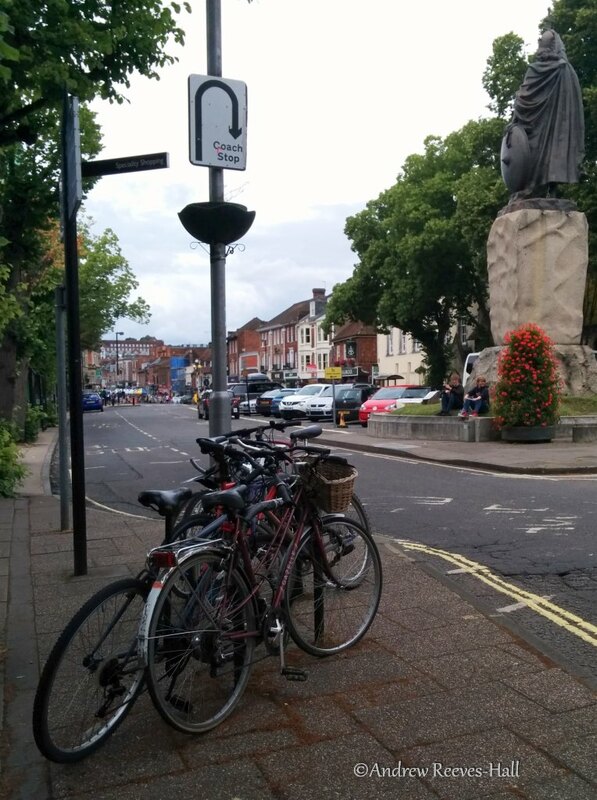 Just like in the days of King Alfred, people’s quality of life has been improved in Winchester; The culture has shifted to one of making wonderful cities like Winchester more ‘livable’, a place where road danger is reduced and people feel more comfortable choosing to (or letting their children) walk or cycle for their short journeys in town. Aside: Apart from Portsmouth and now Winchester, there are 9 towns around Hampshire that have 20mph. One of them, in Whitchurch, has published several articles about the build-up and roll-out of the scheme there; see: THE WHITCHURCH MINUTE. 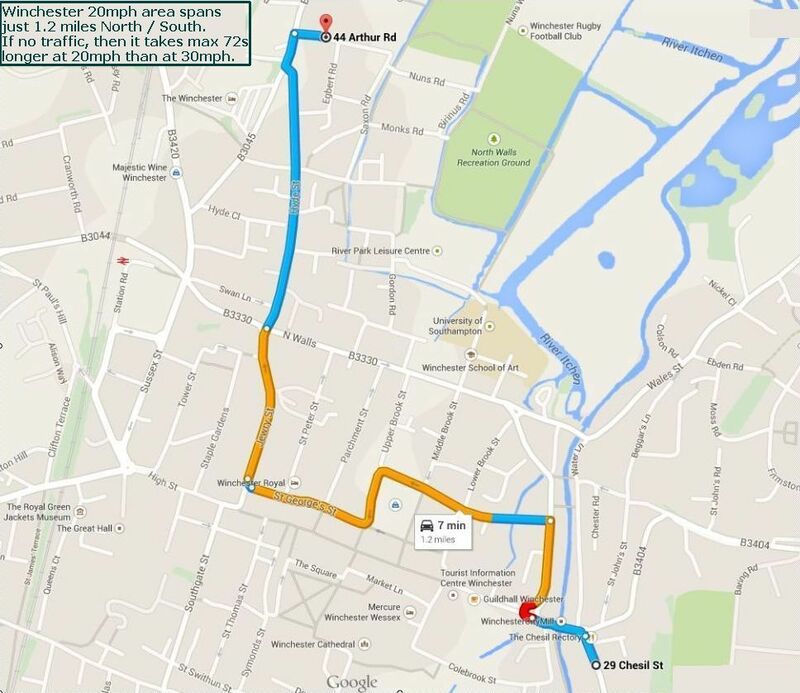 Winchester’s 20mph area spans just 1.2 miles North / South. If no traffic, then it takes 72 seconds longer at 20mph than at 30mph. That’s a difference of 1 minute and 12 seconds. Normal traffic obviously affects the actual amount of time it takes to drive across the city; but that is not affected by the speed limit change: the number of roads and the number of drivers are the same now as they were before the scheme was introduced. 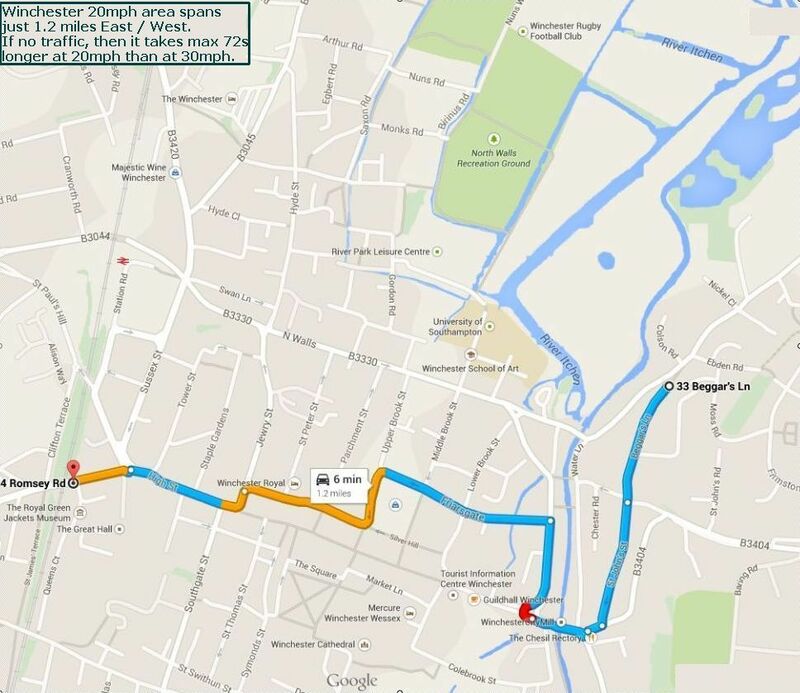 Winchester’s 20mph area spans just 1.2 miles East / West. If no traffic, then it takes 72 seconds longer at 20mph than at 30mph. Over time, though, more people may switch to cycling or walking in the city centre, which would mean there would be less traffic slowing down those who still choose to drive there. 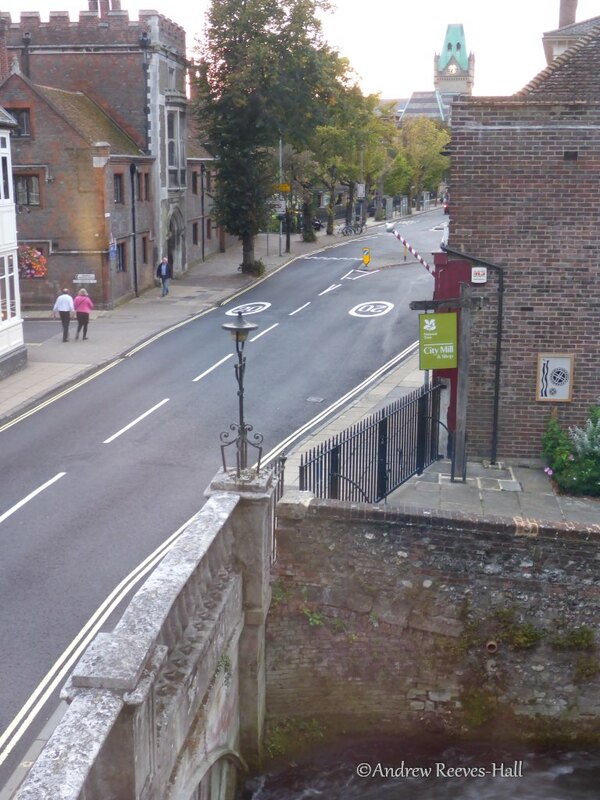 You’ll rarely see Winchester this free from motor traffic! My emails to and from various government and publicly elected officials. Thank you for your response to my email. Dedicated Police speed enforcement activities are directed towards the areas where they will have the greatest impact in terms of reducing the numbers of people killed and seriously injured on our roads. This has been the case for some time. As a consequence, there was no dedicated speed enforcement activity undertaken by the police on the roads now subject to the 20 mph speed limit before the limit was reduced. Therefore, any activity directed to those roads now, as a consequence of the reduction in the posted speed limit, would constitute additional enforcement activity. The interpretation of the expression within the DfT guidance “to achieve compliance there should be no expectation on the police to provide additional enforcement beyond their routine activity, unless this has been explicitly agreed.” is that if an officer, engaged in routine patrol, were to see an offence committed then they are free to deal with that offence, however there is no expectation that officers would be deployed in dedicated speed enforcement activities. The police alone are unable engineer social change, such as reducing the speed at which we drive our cars, we all share a collective responsibility for this. This is why I have supported, to the extent that I have, Community Speedwatch. I would therefore encourage any members of the community concerned about speeding to get involved with Community Speedwatch. I should point out that, despite the name, the Hampshire Chronicle is a Winchester paper, so we are concerned with enforcement in the city and not elsewhere. As you rightly point out, the response to our story has been that the limit is *enforceable*, which is different to whether it will be enforced. Nobody from the force has come forward to contradict its representatives after they told Winchester Town Forum that the limit would not be enforced. If our story were inaccurate or missed the point they would have been the first to say so. While your calculation above is correct, it oversimplifies the many factors that go into making a journey time. For example, it’s worth noting that lower speeds on main roads increase permeability of the road network to local traffic moving onto and off it–everyone has more time to make their manoevre safely. Paradoxically, a lower maximum speed limit might even reduce some journey times, for example off minor roads from which egress to the main road was previously difficult. Only empirical study of many local trips would determine the point conclusively, but this benefit should not be ignored completely. Of course things become more pleasant for pedestrians and cyclists, but there are positive aspects for local drivers too.